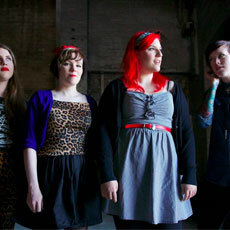 The Villenettes formed in March 2012 and have been causing mayhem in the Adelaide music scene since that August. Their debut EP, V for Villendetta was launched in February in Melbourne and Adelaide, and held the number #1 spot on Adelaide station ThreeD Radio for 4 consecutive weeks. The Villenettes love Elvis, Sailor Jerry, vintage guitars, bad horror movies, leather jackets, leopard print dresses, and running amok on a Saturday night. They play original rock’n’roll with a splash of surf, a shimmy of girl group and a razor edge of zombie punk. The Villenettes want to make you dance like the devil and party like it’s 1959. Watch The Villenettes 'Live at Twin Earth' podcast.